Interlaken area, map No. 254T, at 1:50,000 in a special hiking edition of the country’s topographic survey, published by Swisstopo in cooperation with the Swiss Hiking Federation. 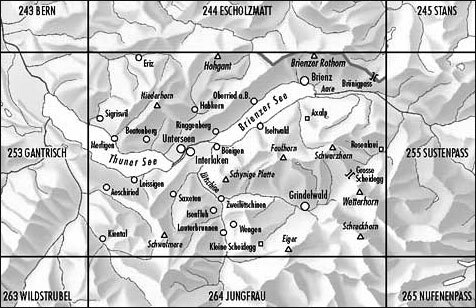 The map is centred on Interlaken and covers popular holiday resorts of Grindelwald, Lauterbrunnen and Wengen, as well as the Brienzersee, the eastern part of Thunersee, the Eiger, etc. Cartography, identical to the standard version of the survey, is highly regarded for its superb use of graphic relief and hill shading to provide an almost 3-D picture of Switzerland's mountainous terrain. Contours are at 20m intervals. An overprint highlights routes maintained by the SHF, distinguishing between hiking routes, mountain routes requiring proper footwear, and alpine routes where equipment is needed. Paths which are part of the national or regional network of long-distance hiking routes are specially marked and in the more recent editions are annotated with their official numbers. The maps show mountain huts, refuges and in remote areas also inns, plus roads with bus service and the positions of bus stops. All the maps have a 1-km grid of the Swiss national coordinates. For a list of all the titles in this series, please click on the series link.